This is a heartwarming story about the power of a mother’s love; truly an ode to women and mothers all over the world. It is a captivating and emotional story that talks about love and loss! Follow Yetunde as she narrates her mother’s ode to her grandmother. It is the Yoruba praise poetry for a mother known as Oriki Iya. Yetunde is also thrilled and delighted by the ancient Yoruba tale passed down to her by her mother about Labakẹ, a young maiden who was kidnapped to be forced to marry a warrior king. Will Iya Labakẹ save her child in time? Is Iya Labakẹ just a simple defenseless mother? Or . . . ? The most fascinating thing about this book is that Yetunde, is nine-months old and very, very funny. On this day, she’s playing with the computer when she notices her mother’s sadness. Being the girl she is, she toddles over and tries to cheer her up. Beaming proudly that she made it on her own, she grabs her mother’s leg. Looking down on her beautiful child’s face, what mom isn’t going to sweep her up into a loving cuddle after such a big accomplishment. But, looking into her mother’s eyes, Yetunde sees that she is still sad so she takes her mother’s face in her hands and gives her a little kiss. It was so precious, and…. However, this moment led up to an even more heartwarming and touching event…storytelling. Yes, Yetunde’s mother cradled her on her lap and passed on one of the many folktales that her mother had shared with her to honor her mother’s passing. Yetunde – An Ode to My Mother, brought back so many pleasant memories of storytelling with my mother, as I’m sure it will for you. It seems to be the backbone of African culture as it is with many others. Naturally, Yetunde – An Ode to My Mother is an ETHNIC read. But, it is also UNIQUE in the way Segilola Salami marries both Yoruba words with English. 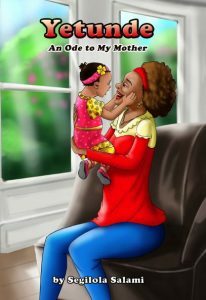 Although the main character is nine months old, I recommend Yetunde – An Ode to My Mother for all children from the ages of infant to twelve years old. BIO From the dawn of time itself African folktales have been passed from generation to generation – in a way that’s almost as timeless as the stories that have survived through the same centuries. Where once the village fire was the lynchpin to the fables spoken around it and from adult to child, author Segilola Salami now uses the written word to do the same – with first her novel Yetunde: The Life and Times of a Yoruba girl in London. With the rise of digital media in this most technological of ages, Segilola goes against the grain and vanguards traditional storytelling through Yetunde. In the same way that African folktales have helped prepare young people for their life ahead, so does the novel by the way of life as seen through the eyes of 6 month old Yetunde. Nigerian born and London bred author Segilola Salami intrinsically knows the heartfelt stories woven through her eagerly awaited novel. With an undeniable heritage and unwavering passion to pass on the tales, she began compiling African stories to tell to her own then new born daughter. With interest mounting from Nollywood investors, all talks are still open and enquiries still welcome for those wishing to turn the book into a 3D animation. 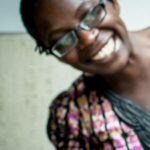 Even in these heady times of increasing success Segilola stays true to both her roots and passion of writing. She is available to hold book reading events and give creative writing workshops to those budding writers that wish to follow in her footsteps. Similarly she is now available to take speaking engagements and write custom pieces for enquiring publications. Since releasing her first book Yetunde: The Life and Times of a Yoruba Girl in London in 2015, Segilola Salami now has a number of other books under her belt and is the host of her own podcast show called The Segilola Salami Show. The show is a round table discussion where she has a number of other self published authors discuss the business of self publishing and review a self published book. If you would like to be a guest on the show or be in the audience, then please contact her now. Segilola Salami is also a self-publishing strategist and provides one to one support to aspiring authors to self publish their own books and make a success of it. Over a number of weeks, she helps aspiring authors navigate the minefield that is self publishing to enable them publish their own book successfully.